Complex targeted attacks and malware are no longer reserved purely for big business. All companies are increasingly tested by the rising levels of sophisticated, malicious emails and social media posts. Are you concerned about potential phishing attacks? How can you ensure that legitimate emails are delivered without delay? Do you have cybersecurity concerns about your employees' use of social media? Are you worried about viruses? External threats come into your business through normal communication channels including email and social media. You need an email security solution that protects your company from all email threats from phishing to malware, spam, and other forms of bad content. What can you expect from a provider of email security? Protect your incoming and outgoing email through endpoint protection. In the event of a successful attack, steps for remediation should be put in place. 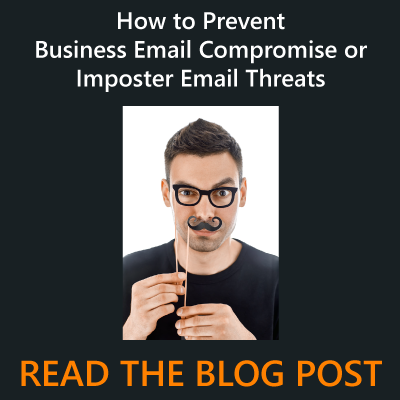 An email security solution should be able to stop malware and non-malware threats such as impostor email (also known as business email compromise). The solution should have filtering capability and business continuity features. Email filtering provides real-time spam and virus filtering while blocking attacks and monitoring traffic. Messages can be approved or blocked within seconds based on sender, origin IP address, attachment size, file type, or text content. Filtering ensures that trustworthy emails are delivered with minimal delay while suspect messages are blocked or quarantined. Why should you use Corserva to provide email security? Corserva’s solution for email security provides our clients with unrivalled protection from viruses and other email threats. The advanced spam filtering capability accurately filters emails by examining envelope headers and structure, content, email sender reputation, images and more, to prevent spam emails, malware, other malicious email and attachment based spam from reaching inboxes. Outgoing email can be automatically encrypted. Email is archived for up to 10 years. But doesn’t Microsoft Office 365 already include email security? Microsoft provides only basic email security features, relying on traditional filtering techniques such as IP reputation, volume, and signature based antivirus scans. Unfortunately, the security features available within Office 365 do not provide the advanced security capabilities needed to stop phishing attacks. With Corserva’s solution for email security, data is protected from targeted spear-phishing attacks and zero-day malware. The solution uses advanced machine learning techniques and analysis to protect users from the most cunning attacks. Additionally, the continuity feature of the solution means users will always have access to their email, even if a server fails or unexpected downtime occurs. Gain the Gartner market leading software solution for email security combined with Corserva’s advanced expertise. The solution is scalable to fit the needs of SMBs looking for a simple experience as well as enterprise clients requiring advanced controls. In addition to accurate spam and malware detection, the solution provides contextual understanding of phishing attacks. Email security should be one part of your recipe for a secure IT infrastructure that includes endpoint security, network security, and SIEM analysis. Corserva has the experience to create the most effective security solutions for our clients. When multiple occurrences of harmful traffic is coming from a single server, our solution blocks a wide range of attacks including Directory Harvest Attacks (DHA) and denial of service attacks. Attacks are detected and blocked in real-time and the source IP address is temporarily blocked. Email filtering can be customized to block and allow email based on sender, recipient, size, content and other factors. Viruses are blocked and users can adjust to what level spam protection is set. The way suspicious messages are quarantined can be customized so that logs can be kept and quarantined messages can require review before release. Users can review what messages are being flagged as spam and review quarantined messages to make sure legitimate messages are not flagged. 1. Set up and configure a secure, Microsoft Azure cloud. 2. Connect email security software to Azure cloud and synchronize individual email accounts to use new email security software platform. 3. Validate email flow from email security software platform to individual email accounts. 4. Configure customized whitelists and blacklists. 5. Test all inbound and outbound mail flow. 6. Check email security service logs and correct any anomalies.